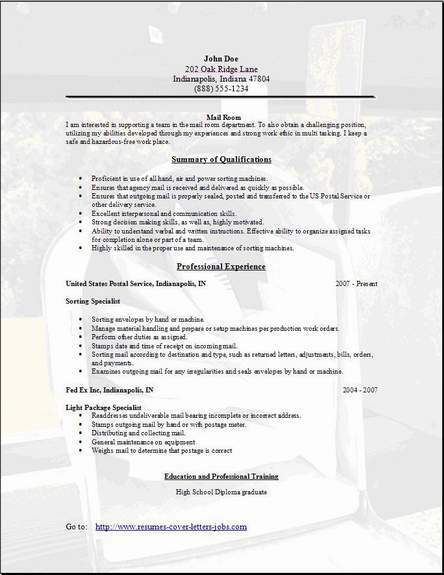 Send this page by e-mail to your friends so they can pickup their own formatted resume, all free. Download--then just go ahead and put the file on your PC's Desktop---same file name. So easy finding it later when it is on your desktop. Literally 100's of ways to help you, check it out now. Some of the responsibilities for this mailroom position. You will be sorting incoming mail for distribution and preparing outgoing mail for delivery.You will ensure that mail is received in proper department and transferred to sorting department as quickly as possible. You will be making sure that any outgoing mail is sealed, posted and transferred to the US Postal Service delivery dept. This type of work also includes stamping the date and time of receipt of all incoming mail.You will perform various sorting duties, handling mail according to destination and type, like returned letters, adjustments, and bills in a separate bin. You could possibly be stamping undeliverable mail with a rubber stamp template, incomplete or incorrect address. 1. Stamp all outgoing mail by hand, or with a postage meter. 2. You may need to address mail, using addressing machine. 3. Weighs mail to determine that postage is correct. 4. You will also examine all outgoing mail for any unsealed flaps or lids, then seals envelopes by machine. 5. This is a great fast paced job that will keep you busy and time will fly by. 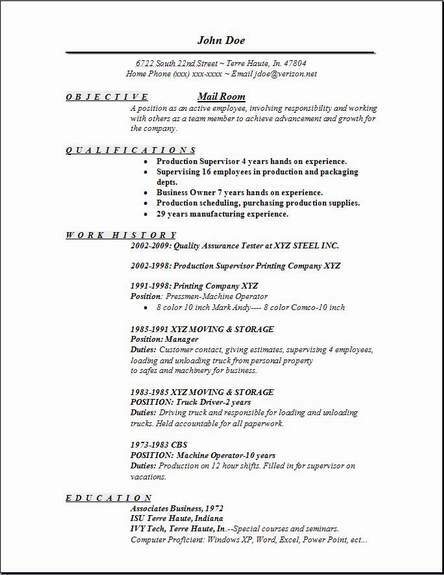 These are the 3 resume formats I would like you to use most when you arecreating your resume. I like the format. The look is real, but doesn't over due it with design. I want you to use these as examples. You already know what it will look like when you are done. So now all you do is backspace and insert your own info. Thats easy to do and easy to end up with great looking results. 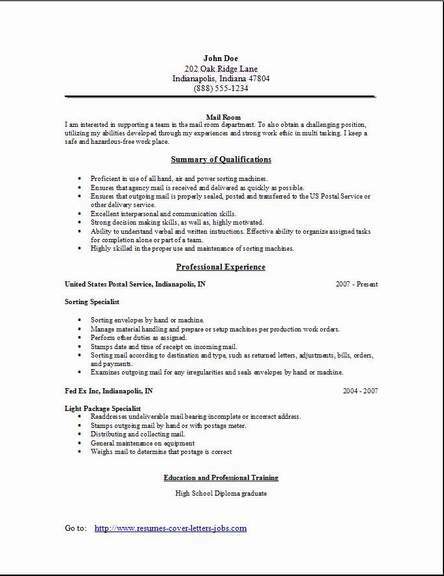 Gather all the information you can off this website and put together the strongest possible mail room resume possible to get the interview you deserve.